Items other than apparel are fulfilled and shipped from our main warehouse in Beaumont, Texas. These items include (but are not limited to) the following: Books, art prints, postcards, holiday cards, and mugs. Orders are shipped the next business day after we receive them. These items are shipped via USPS or FedEx, depending on the shipping method you select at checkout. Orders to Texas and Louisiana typically take 1-3 business days to arrive. Orders to other states may take up to 5 business days to arrive. Apparel items are shipped by our fulfillment partner. These items include (but are not limited to) the following: Shirts, shorts, pants, pillows, tote bags, and infant wear. Because these items are fulfilled by a 3rd party service, they will arrive separately from other items you may receive as part of a full order. Depending on the shipping method selected, apparel products typically take 3-5 business days to arrive. We do not ship on weekdays that fall on national holidays. Furthermore, unexpected delays may occur around holiday seasons due to a general increase in shipping demand. While we do not have control over such delays and we cannot assume fault, if you have a time-sensitive holiday order that is taking longer than expected, please let us know so that we can see how we may help. Please contact us for assistance. Be sure to provide your order number so that we may assist as quickly as possible. We strive to ship orders as quickly as possible, and we’ll do everything within our power to ensure your order arrives expediently. Can I track my order through USPS or FedEx? We do not automatically offer shipment tracking codes at this time, but we plan to do so by early 2019. If you chose USPS First Class shipping, we can manually check the shipping status for you on request. If you would like to do so, please contact us and be sure to include your order number. Any order over $75 (before shipping and taxes) qualifies for free shipping automatically. We’ll send you a one-time coupon for free shipping when you sign up for our mailing list. We’ll soon offer bundled products with free shipping as a promotion. Check back soon! Keep an eye on our social media feeds for other great offers! We believe in our products and love the people who support us, so we want your shopping experience to be as positive as possible. If you have had a negative experience with an order, please contact us with details (including order number). If we can work out a way to help, we’ll be glad to do so. Items that are damaged in transit may be returned within 30 days of purchase for a complete refund. If the item is part of a larger order, we will be happy to issue a partial refund for just the impacted item. If you have been shipped an item that you believe is damaged, please contact us as soon as possible for help. We may request a photo of the damaged item. When approved, we will send a paid return shipping package to you to return the damaged item to us. Upon receiving the item, we will issue the refund. In most cases, we cannot issue a refund on undamaged items that are simply not wanted after purchase. That said, we’re happy to discuss the specifics of your order and see how we can make things right. Please contact us within 15 days of your order to discuss. In exceptional cases where we do refund an unwanted order, you should expect to receive a partial refund that allows us to cover our shipping, handling, and restocking expenses. 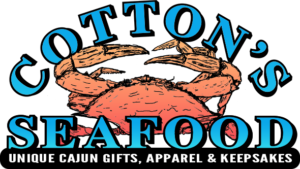 We are Cotton’s Seafood, an online Cajun gift shop. Our website address is: https://www.cottons-seafood.com. 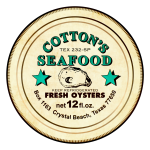 Cotton’s Seafood is a venture of Inks, Inc., d/b/a Blue Pelican Publications. Learn more about Blue Pelican Publications. 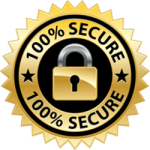 We use MailChimp to maintain a mailing list on customers who choose to grant us this access. The mailing list can be signed up from various prompts on the website, including a checkbox on the checkout page. When a customer opts in to this service, MailChimp stores limited contact information (name and email address), along with information about their purchase history, which we use to help ensure that any email marketing we send out is relevant to our customer’s needs. We periodically email such customers to inform them about promotions and new products on our site. If you have opted into this service, you may unsubscribe at any time. Doing so will keep us from email marketing to you, but you will still receive store notifications when you complete an order or reset your store password. If you have unsubscribed and would also like us to remove your historical information from our mailing list, please contact us. If you use a contact form on our site, we will also receive your IP address and the date and time of your entry. This information is collected automatically through our website’s form system, and we do not use this for marketing purposes. If you have any questions or concerns about our shipping and privacy policies, we welcome you to contact us. We’ll be happy to help with any questions you may have.